A Jain Family's Trip to Paris! Things to do on your family trip to Paris! 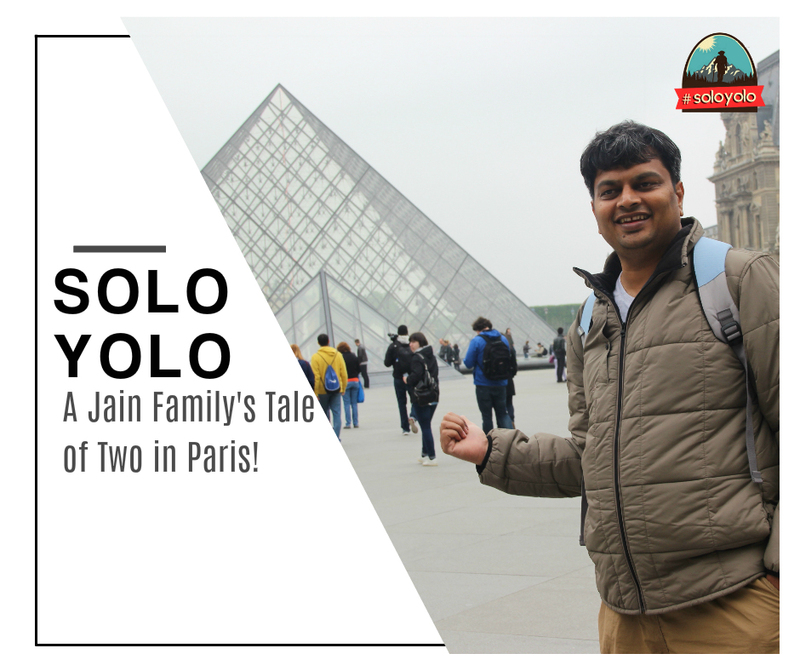 Pranesh on his family trip to Paris! Being Jains traveling by ourselves was challenging and intimidating on our maiden abroad tour, to Europe, especially arranging Veg. food leave aside Jain food! Nevertheless this became a dream tour of a lifetime for us. We could not contain our excitement as we sat in the car with Madhavanandji from Iskcon - Paris, who had come to pick us up at the Charles De Guile Airport. A quick ride across the colonies on the outskirts of the city took us to the Iskcon Ashram where we were to stay for the next five nights. A nice cozy place with an Indian milieu, in the middle of a suburb, at a distance from the bustling city was welcoming. We dumped our luggage in our clean bunk bedded room and headed straight to the towering excitement every one heads for in Paris - The Eiffel. We bought a five day Paris pass from Sarcelles Station that enables one to travel anywhere around the city by Rail or Bus. Major tourist attractions have stations underneath which are easily accessible by the Metro. They say that anywhere in Paris you are not more than a few meters away from a Metro station! Our first trip in the Metro was exhilarating as we changed couple of trains en route the station to Eiffel Tower, with the help of an easy to read Metro map. It was drizzling late in the evening as we came out of the station, when the moment of a lifetime left us awestruck, we were standing in front of - The Eiffel Tower. Seeing it in a picture one cannot fathom the hugeness, scale and its beauty as much can be appreciated witnessing it in reality. It kept us dazzled over a couple of hours as we sat there staring for long, went to the top to see the glittering city laid around us - a mesmerising experience, came down to stare again at the beautifully illuminated tower at night, sitting there on a lawn as the tower twinkled periodically as we sipped the alluring wonder of art and science. Interested? Check out the Paris holiday package on Tripshelf here! ☀ Day 2 - Full Day City Tour with Desi Sandwiches, Instant Bhel & Ready to Eat Meals! Next day we took the metro to the Louvre Museum Station and clicked some snaps at the Giant Pyramid reminding us of the novel - Da Vinci Code. From here we did a city tour in the local transport buses which came free with the Paris Pass. First was the happening Montmartre were we went to the tallest structure of Paris - Sacre Coeur, white sanctifying Basillica on a hilltop. Sat on its footsteps hearing a soothing harp played by an artiste enjoying the view of the city from the top. Enjoyed a funicular ride downhill. A bustling market and energy around the place is vibrant with roadside painters and cool Cafes sprawled around. We had bought foot long eggless breads and made our own cling sealed Sub Sandwiches that we munched with a bottle of Tang that lasted for the day. We took a bus ride to Trocadero a beautiful view point to enjoy the Eiffel from the other side across the Siene River. En route we saw the beautiful Arc De Triomphe reminding us of the - Gateway of India. Saw the National Art Museum quickly and left for the Majestic Notre Dame, an engaging Gothic Church with a rich history. We had an opportunity to witness a religious procession inside the Church, which was carrying a thorn crown worn by Jesus! From here we walked to the famous Pont Neuf bridge and the romantic love locks bridge Pont des Arts. After a quick meal of Instant Bhel on the banks of river Siene we walked down to the Pantheon a magnificient Roman structure, which had shut for the day. Tired from walking, we took a bus ride from here passing through the streets of Latin Quarters, saw the beautiful Jardins of Luxembourg Palace, passing several famous monuments on the way we reached the famous public square of Paris, The Place de La Concorde. From here we took a bus to La Defense, the only place in Paris which has modern development with multi storied buildings. The ride was on the famous - Champs Elysees Avenue, the fashion high street lined up with big brand stores including the grand Louis Vuitton store. Enjoying the ride through this we ended the city tour at La Defense. We ended the day with a ready to eat instant meal we were carrying along with us! If you're looking for an opportunity to re-live my vacation, wait no more! Cover the best of Paris & Switzerland! Check out this holiday package to Europe for 6 nights from Bonton Holidays. ☀ Day 3 - The Vast Beauty of Versailles Palace! On our third day we visited to the Versailles Palace, which is huge and maintained, although all of it does not house exceptionally great exhibits except the mirror room. The imagination of someone living in such grandeur and the stories of the opulence of the Royal people leaves one exasperated. The gardens also steals the heart, vastly spread with numerous fanciful fountains that operate on fixed days. Huge manicured plant walls and greenery is so well maintained that it feels like an ethereal maze carved out of nature. One can save time and energy by hiring a Golf car around the gardens, which we could decide only on hindsight because at the end of the day we were exhausted. Our fourth day was the first Sunday of the month when all the Museums in the city give a free entry. Although we bought a quick entry ticket for Louvre, picked up a map and marked the floors and exhibits we wanted to see and scuttled around the never ending halls of Louvre excited to see some famous creations, but the peak of the adrenaline for everyone around seems to be the Mona Lisa. By now everyone was sure to feel why is this painting so famous, when there are thousands of paintings, sculptures, creations lined up all around the seemingly never ending Museum. For every art lover this place sure is a pilgrimage of a lifetime. From there we went to see the underground eerie skeletal collection, The Catacombs, which unfortunately we could not make it, as they give limited entries per day. It was doubly disappointing as we had missed the beautiful Musee De Orsay for the same. From here we went to see the Rodin Museum, a lovely place where his sculptures and creations are displayed in a well kept palace, including the Thinker we all have seen. And lastly the most happening of Museums, Centre George Pompidou! Right from the atypical modernistic architecture of the building, to the modern creations housed in and the energy of performers in and around the place, everything was intriguing. We still could not see many good museums, but for a day this was a good enough dose of art. ☀ Day 5 - Last but not the least, Disneyland! The Last day of our trip was to the Disneyland. We had bought a two park ticket beforehand that saved time and money. We started our day early at Universal studio, took a map of the place and figured the thrilling rides and things that would appeal us more besides which rides were offering fast passes so that we can save time standing in the inevitable queues. A Great Roller coaster and few good rides, a live and movie - both combined stage show and a stunt show, were the adrenaline pumping moments we enjoyed until 3 pm. After that we rushed to the adjacent Disneyland, aided with their map again chalked out a plan as we enjoyed some great rides, the live Parade, loved the fanciful Fantasyland and were amazed, entertained and catapulted in another world when we witnessed the late night Disney show, an electric mix of laser, animation, fireworks, audio-visual musical, projected on the dreamy Disney castle. You should definitely check this Trip to Europe for 12 nights, if you have a little more time on your plate! Bonton Holiday's package will let you explore all of Rome, Pisa, Padova, Innsbruck, Switzerland, Paris and Amsterdam! It was time to bid adieu to the city of Love, to the trip of dreams, to Paris - A beautifully laid out city, amusing as if a big living museum and a work of art itself. The french, not exactly tourist friendly, are trying to overcome the snobbishness attributed to them over the years. We had more then we dreamt of from the tour. We had missed many things due to a tight schedule including a walk in the Tuileries Garden, Pere Lachaise Cemetery, Catacombs, Musee d’Orsay, Musee de l’Orangerie, Lido Show, Mouline Rouge, Musee Picasso, French Cuisine or wine being Jain Veg Teetotalars and many more attractive things. We promise ourselves to come back to Paris for a longer stay. Wonders of Lisbon in a Day! Thailand Package? Please confirm your details!